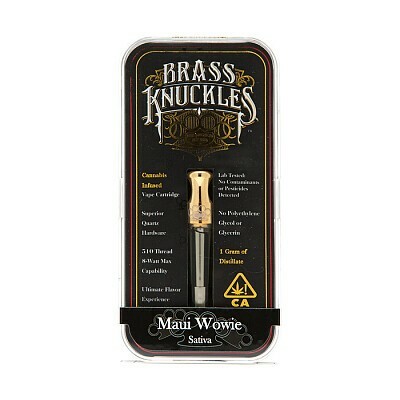 Go on an all-inclusive island vacation with Brass Knuckles Maui Wowie Cartridge. This Sativa strain is best known for its tropical mango flavors and citrus aftertaste. Each puff of Maui Wowie offers an accelerating high that begins with a cerebral flourish and washes into a mellow body buzz. Brass knuckles is the leader in super premium CO2 extracted cannabis oil. Known for flavor and potency, each cartridge contains a full gram of oil and works best with their 510 thread Brass Knuckle vape battery.